Chief Complaint: Red, irritated eye with decreased vision. 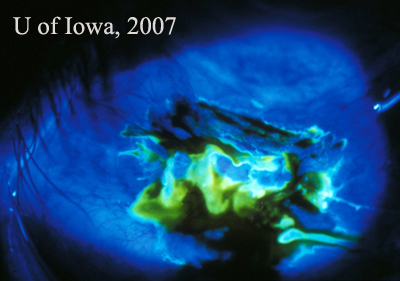 History of Present Illness: A 74-year-old female presented to the University of Iowa Department of Ophthalmology glaucoma service with a 1-day history of conjunctival injection and mild discomfort in her right eye (OD). She had a known history of pigmentary glaucoma that was treated with a combined procedure of cataract extraction/posterior-chamber intraocular lens (PCIOL) and trabeculectomy with mitomycin C in the right eye five years earlier. Her visual acuity had decreased from 20/125 (5 months previously) to 20/250 OD on presentation. Past Ocular History: Pigmentary glaucoma (OD), age-related macular degeneration in both eyes (OU), and lattice degeneration (OU). The patient had suffered a severe retinal detachment in the left eye (OS) with very poor residual vision despite treatment with a scleral buckle procedure. 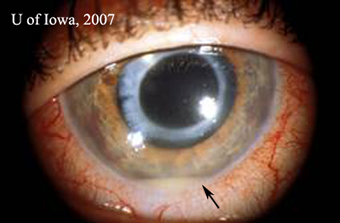 External and anterior segment examination, OD: Conjunctival hyperemia with papillary reaction. There were 3+ cells (per high power field) visible in the anterior chamber with a small (0.75 mm) hypopyon (Figure 1A). The right eye had an elevated, thin avascular bleb with a small infiltrate visible within the bleb (Figure 1B). The bleb had a positive Seidel test (Figure 2). Dilated fundus exam (DFE), OD: 2+ vitreous cell with a hazy view. Visable retina appeared to be normal. Course: The diagnosis made was bleb-related endophthalmitis. The treating physician performed aqueous and vitreous taps, administered intravitreal vancomycin and ceftazidime, and prescribed hourly topical, fortified gentamycin and vancomycin drops. The patient responded well to the combination of intravitreal and topical antibiotics. Her visual acuity has returned to baseline and the bleb leak resolved in two months. Two years later, she developed a recurrent bleb leak and underwent bleb revision. She has had no further bleb-related infections. Figure 2: An example of a positive Seidel test of a leaking trabeculectomy bleb in a similar case. Discussion: The differential diagnosis of a red eye after trabeculectomy includes blebitis and bleb-related endophthalmitis. Blebitis is an infection limited to the filtering bleb, whereas bleb-related endophthalmitis is an intraocular infection that includes the vitreous. Inflammatory cells may spill over into the anterior chamber in blebitis, but the vitreous is quiet. The presence of inflammatory cells within the vitreous is key for differentiating blebitis from bleb-related endophthalmitis. There is no consensus on the management of blebitis, and glaucoma specialists have a variety of practice patterns1. Blebitis can usually be treated with intensive topical antibiotics (such as fortified gentamicin and cefazolin) alone 2. Some surgeons also use parenteral and subconjunctival antibiotics. 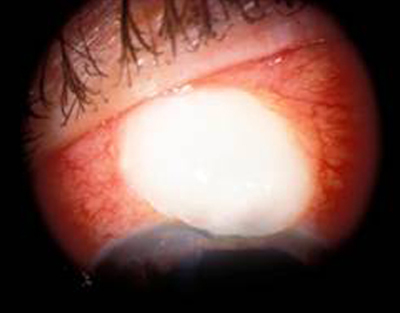 If the infection extends into the anterior chamber and the vitreous is involved, then the eye should be treated as a full-blown endophthalmitis. Anterior chamber and vitreal samples should be obtained for culture. Forster et al3 demonstrated more than 25 years ago that the yield of organisms from the anterior chamber tap is frequently less than the yield obtained from vitreous taps. Similar findings were reported subsequently in the Endophthalmitis Vitrectomy Study4. The intraoperative application of MMC often is associated with the formation of an avascular bleb and an increased risk of endophthalmitis5,6. All patients who have had trabeculectomies need to be taught the signs and symptoms of blebitis and endophthalmitis, and they should be told that they must report immediately if they develop a red eye, purulent discharge, or pain in the eye2. Reynolds AC, Skuta GL, Monlux R, Johnson J. Management of blebitis by members of the American Glaucoma Society: a survey. J Glaucoma. 2001;10:340-347. Alward, W.L.M. Glaucoma: The Requisites in Ophthalmology. St. Louis : Mosby Inc; 2000. Forster RK. Etiology and diagnosis of bacterial postoperative endophthalmitis. Ophthalmology. 1978;85:320-326. The Endophthalmitis Vitrectomy Study Group: Results of the Endophthalmitis Vitrectomy Study: A randomized trial of immediate vitrectomy and of intravenous antibiotics for the treatment of postoperative bacterial endophthalmitis. Arch Ophthalmol 113: 1479-1496, 1995. Soltau JB, Rothman RF, Budenz DL, et al. Risk factors for glaucoma filtering bleb infections. Arch Ophthalmol. 2000;118:338-342. Lehmann OJ, Bunce C, Matheson MM, et al. Risk factors for development of post-trabeculectomy endophthalmitis. Br J Ophthalmol. 2000;84:1349-1353.